The cornerstone of the day in grade school is the Main Lesson, a two-hour period in the morning when the children are most ready for academic work. Main Lesson blocks usually last from two to four weeks and focus on one curricular goal. All Main Lessons incorporate the arts, including storytelling, movement, music, poetry, drama, drawing, painting, modeling, reading, and writing. Students record and illustrate their lessons in Main Lesson books that are treasured for years. Class teachers remain with the same class throughout the eight elementary years when possible. As a result, the teacher and students build close, secure relationships that accommodate individual needs, and the teacher-parent relationship functions as a partnership. 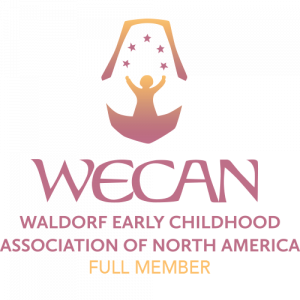 The Waldorf curriculum is designed to give children meaningful experiences at every age. The pace of the curriculum allows children to learn when they are ready. If a child has been given sufficient time to develop and to acquire academic skills and is still struggling, class teachers and specialists collaborate with parents to provide the support necessary for success. During the first four years of grade school, the curriculum slowly expands from the experiential learning of kindergarten to include more lesson work. The curriculum and class environments are designed to allow children to enjoy the innocence of childhood. Families are encouraged to limit media exposure to maintain healthy routines at home that allow their children to fully experience childhood without the worries and cares of adult life. Every aspect of the curriculum is designed to inspire imagination, cultivate creativity, encourage freedom of thought and expression, and promote problem-solving. Middle-grade students participate in special activities that nurture their sense of adventure and exploration, and reflect their growing individuality and critical-thinking skills. Fifth graders study Greek history and participate in a multi-school pentathlon. Sixth graders experience a “coming of age” celebration where the community of adults welcomes students as they take their first steps into puberty and adult life. Sixth and seventh graders participate in a wide variety of activities to test their skills and knowledge such as solar car races, conservation speeches, and more elaborate theatrical productions. Eighth graders plan their class trip which is the culmination of their years together as a class and the end result of many years of fundraising projects.